Questions, problems? Please leave a comment below or send us an email. If you have ideas on how to impove this app, we’d love to hear from you! New versions of HomeWave will regularly add new features to the various device controls, or fix issues with these controls. When you upgrade your installation of HomeWave, it may be necessary to re-link these controls to their respective devices, in order to take advantage of bug fixes or new features. This will be indicated in the change log with a # if this is the case. Support for arbitrary plugins (device wizard). File dialog functionality (deleting files, etc) / Revamp of the file dialog. When adding controls to the Today widget on an iPad, the list of devices matching the cosen control type never appears. To fix: tap Refresh. Activating a scene that causes a Push message to be sent to HomeWave may cause the app to disconnect and re-send the scene command, causing a loop. Setting Normal / Eco mode doesn’t work on the Smart Virtual Thermostat (though the control accurately reflects the thermostat’s mode). Deleting a screen button from the home screen sometimes leaves the associated control screen in place, visible when swiping through screens. Workaround: close and kill HomeWave, then restart. Setting the Background Image Transparency to zero on Home or Control screens will render the buttons on that screen inoperable. In your version history you claim that you support the iphone detector’s mute and unmute feature in your app. This is the main reason I bought this app and still I can’t figure it out how to enable or disable that mute and unmute feature. Could you please give me some hints about it? Add a regular on/off switch and link it to the iPhone detector; it’ll show up in the list of devices. You can then mute / unmute the detector using the switch. Doesn’t seem to function. I’ve tried with and without spaces in the code. This is due to a bug in HomeWave where the spaces in your command aren’t translated to something valid for use in URLs. This will be fixed in the next version. For now, replace all spaces in your string with %20 and it should work. Hey thanks for the reply, I tried your suggestion. My IR transmitter doesn’t even flash as it does if I were sending commands through scenes. The version history says that it supports the iphone locator mute and unmute feature. I can’t find that option to activate. This is a known issue due to a change in the way thermostats are reported. This is fixed in the next version. There’s still a lot of work to be done to finish this version but the release may be brought forward to address this crash, so stay tuned! I have been using HomeWave for a long time now and to me it is the best controller available for Vera. I have tried every app I could and nothing comes close. With that said is the possibility of an Apple Watch App being considered? It would be great to be able to control devices without having to have my iPhone or tablet directly with me in the house. It my understanding that as long as they are on the same network as the watch they will be able to interface even if say the phone is in the bedroom and I am in the family room with the watch. I’m currently looking into options for adding support for the Apple Watch. I too would be very interested in this! Changing the temperature works, but the new set point is not displayed. The app shows the setpoint as it was when I installed Homewave. The app was working flawlessly until today when in keeps crashing. It will stay open for a couple of seconds then shut down. I’ve tried it on multiple devices with the same result. Can you try deleting the app and reinstalling, and see if the crash still occurs? If not, please send me your config file so I can examine it. Noticed that since the first of the year the dimmer slides are often unresponsive. I went to the Mios webpage and the iPhone generic vera app and the dimmers adjusted quickly and correctly. There may be a problem in the newer version with dimmer switches. I have a veralite and use leviton and evolve dimmer switches. I Update to Homewave 1.98 and now in all my window covering buttons, the stop doesn’t work. I can up and down the curtains but I can’t stop them. 2) On the same settings page, turn off the “UI5 Firmware” switch for your Vera. This will re-establish remote connectivity. Everything else will work as before. Have you tried controlling it from the Vera interface directly as well? If there is a transmission error, your lock may be too far away from Vera, and because of the secure Z-Wave communication with locks, most Z-Wave equipment will not be able to relay this traffic to the lock. Is there a known memory leakage/cache bug in v 1.93 ? One other person has reported this issue, but for a different version of iOS. It was solved by saving the configuration of HomeWave to Dropbox, then deleting and reinstalling the app. Make sure to save the config to Dropbox or it will be deleted along with the app, and also check the size of the config file. For a vera3 system. Is there an ability to show weather underground? I’d like to show 3 day forecast and click a button for radar. Is that possible? Also what do you have for home energy meter? Support for Weather underground or home energy meters is very basic at this time. You can use a “Multi value” control to display up to 3 arbitrary properties from any devices (including energy meters and the Wunderground plugin), as long as those properties are being reported by Vera. The app’s settigns have been moved from the “Settings” app of the iPhone to inside the app itself. On the home screen, click the “i” button to access them. 1) Is the Device ID of your Vera filled in correctly? What is the time this feauture/upgrade soon? When the upgrade version is in the AppStore? How can i make on dashboard widgets “outline border”? Micasaverde plugin is will sometime (etc. Jump other doashboard see Imperihome plugin)? Would there be a possibility to display the “Total Precipitation” of the Virtual Rain Sensor. I’m using this app to display irrigation override in case total precipitation exceeds threshold. Yes! You can use the Multi Value Display control, link it to your rain sensor, and select the value(s) you want to display. We need to customize your iphone app to work with our home automation solution. We wanted to partner with you on the same. Kindly contact us. Please do add a “contact us” to your website so we can enquiry on your product. I am finding this app very confusing. I currently use TrickTV and it has all of my devices and scenes that appeared automatically when I got it. I thought your app was supposed to be better but it doesn’t bring up anything. It does show it is connected to Vera but nothing else happens. Unlike other apps, HomeWave requires you to manually add all of your devices and scenes to the interface. This is more work but does allow you to lay out the interface exactly the way you want. I just purchased your app for my iPad to run my Vera 3 Z-wave system. I have carefully followed your direction on your home page under “getting started” but can not get it to work. It recognizes my Vera system on my WiFi and has the correct IP Address but no luck getting to my devices. I need some help. Is there a phone number for tech support that I can call? Hi Thomas, apologies for the late reply, this is due to holidays. Please note that with this app, your devices will not appear automatically, but have to be added manually. Have you tried going into edit mode and used the + button, selected a device type (on/off, dimmer etc), and selected the corresponding device on your Vera? At what point in this procedure are you having issues? I have recently noticed an on/off button at the bottom left of the full view screen for viewing a camera. I can’t see that it does anything whether on or off. What is its function? In the Vera UI, you have the option to associate lights with a camera, and when you view the camera image Vera will turn those lights on. The switch in the camera view is to turn those lights on or off manually. Note that a new property in the camera control lets you set the default behaviour; in previous versions the default was to turn the lights on. Does this app support RGBW module? Can i change colour by pick of pallete? I buy this app – if HW have this feature. HomeWave does not yet have support for the RGBW module. It will appear as 4 dimmers, but you are not able to use the Palette control to pick colors. This is planned for an upcoming version. Plz. I’ll give you Benjamins to make this happen. I love this App,can you add support for “Sq blaster+” plugin. I am planning to add some support for Audio / Video device control, including those controlled via the SQ Blaster. Any chance on the security setup you could have option for buttons instead of rose style buttons? Then you could check box which buttons you want to show. Most systems only need something like Arm Away, Arm Stay, Disarm. When you choose cool or heat it shows the desired temp but you would think after a moment it would switch to actual temp. It does not seem to show actual temp unless you go to Auto mode. Also in Auto mode you cant adjust temps up or down, maybe by design but thought I would ask. Cant seem to get connected remotely. Is Vera 3 remote connections as buggy as it seems??? Remote connection is now working for Vera’s on the new UI6 firmware. If you enter your username and password in the settings, it should connect remotely. The thermostat setting never shows the actual temp, when set to Auto it should show either the cooling or heating setpoint depending on whether your thermostat is cooling or heating the house, and if the thermostat correctly reports that mode to Vera. If it doesn’t, then you’ll have to use separate controls for the two setpoints. To see the actual temperature, add a “sensor measurement” control and link it to the thermostat. I used this app for Vera, and I have switched to Fibaro but still using Vera but now as slave controller. Is there any future development on your side to integrate the Fibaro into the Homewave aswell. because that would be very nice, instead of a 2nd Vera a Fibaro as 2nd unit. Although Fibaro has nice Iphone and Ipad apps you cannot freely configure the interface and that is what i always liked from the Homewave app. And on the Fibaro forum I noticed the demand for free to configure interface is high. Can you activate the audio for the security cameras with this app? Audio is not supported, as all camera data goes through Vera. However an upcoming version will support direct connection to the camera (when on local WiFi), and that can include audio. I am trying to define push notifications on my Iphone for the HomeWave Push Plugin on the micasaverde. It’s not working and I am getting “No valid push ID” error. I define in the Iphone the PushID 41 and the same in the micasa app. A Push ID should be at least 20 characters. The reason is that Push IDs are not tied to any user account, and such a length will reduce the likelihood of picking an ID that another person has already chosen. I can display with Homewave the power usage, some historic value, the cost using the current cost plugin of Veralite. Have in your planned changes the possibility of display a power gauge graphic starting from real value ? I have the Trane thermostat. It works fine with Vera and Homewave, except, my thermostat has Eheat mode which is used during the winter. I cant seem to access it from Homewave controls. I have off, auto, cool and heat. Would be nice to allow me to enable eheat (heatstrips) mode from app. I was hoping to see support for multiple vera’s (3) in the latest release as suggested in the previous release. Is this still a planned feature ? I just downloaded you app on my ipad. I’ve been able to add my vera 3 cameras, locks, etc to the screen. My question is there a way to add my 2 Nest thermostats to this app? If so where can I get instructions to help me add them. Also I have a monitored ADT alarm system at the house. Can that also be added to this as well? I like what I see from the APP so far. Much better than the micasaverde app. Thanks! For the lock buttons and light buttons, when I try to customize them to show an icon/image when the light turns on/off or door is locked/unlocked, the icon is not appearing. Have you specified images for both the on and off (locked / unlocked) states? I had only picked an icon for when it was locked, but I did set one for locked and unlocked and it worked. Also, I have seen some pics online where it looks like there are grid lines around some boxes, is there a way to add grid/boundary type lines? My MMS Vera seems to see everything just fine. I have this same issue I can not get the app to work remote but MMS Vera works. I sent in a log. Please help. However, I can’t get it working remotely while not at the home network, I have tested all the settings without success, and no error message provides just doesn’t work. Hi Lars, did you enter the following information in the Settings? I am having the same issue. I can log on with other apps off wifi but not this one. I really prefer this one over the one that works! I must be doing something wrong. I turned off wifi, enabled logging and emailed a log to you. Thank you for the help. Hi, any way to control the units in a sensor reading. They come out F when C is the unit of the value that is displayed. I have my Vera set up with the Temperature format “English – F” because my thermostat only works with integer temperatures. Degrees C are is too big, so I use F. However, the World Weather plugin, which produces the “Temperature” sensor value I am showing in Homewave, allows you to specify “Metric” or “US Units”. I have picked “Metric” for the units so I can match up with the local weather forecasts, but Homewave shows the value with an “F” not a “C” and there is no option to change the literal. The Homewave sensor implementation seems to be using the Vera units setting instead of the World Weather plugin setting that the displayed value is taken from. Any thoughts on adding an option to change the “F” “C” literal ? I live in the US. My thermostat is using “F” but the HomeWave app shows only “C”. When I change the temp using the HomeWave app it drops my temp all the way down to 35F… how can I change it from C to F? Porting HomeWave to Android will be a sizable job. I am planning to get started on this once the iOS app is more or less stable, which will be after a few more releases. I can’t give a timeline, though. Fantastic control – by far the best around. I was wonding if it is possible to arm/disarm a motion sensor? As far as I can tell, you can only note if it is tripped or untripped. And is there a way to set a push notificatin for a trip? You can enable arming / disarming of sensors in the control’s properties. Push notifications can be sent from Vera to HomeWave, please see this page: http://www.intvelt.com/wordpress/push-notifications/ The easiest way is to use the HomeWave Push and VeraAlerts plugins to do this; you can find info on how to set up veraAlerts on the Micasaverde forum. I have the app on an iPad as well as iPhone, and am having trouble with the interface to new Envisalink. Everything seems to work fine one day, then the next I find that the app will not control the DSC security system, arming or disarming. All other controls still work. 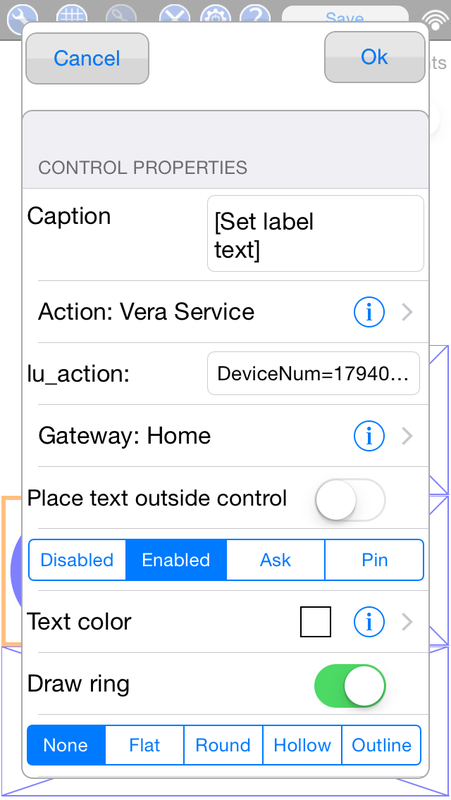 I can control the system with a scene through the vera mobile app, so I know that the Envisalink works, and have made no changes to setup, it will start working again a few hours later…..it’s as if the “security” button just stops working for a few hours. Any ideas? In principle, the commands that HomeWave sends to Vera do not change over time once a control has been added to HomeWave and linked to a device. There could be an issue in the DSC plugin, but so far no one has reported one. Have you set the alarm control in HomeWave to “PIN”, i.e. make it ask for HomeWave’s PIN before the control can be used? If so, try it with the control set to “Enabled” instead of “PIN”. If that doesn’t help and the issue occurs again, please go into the app’s Settings and enable logging, then try to arm / disarm the alarm again. Once it fails, go to the Info screen and mail the log file using the button there. Then disable logging again in Settings (it affects performance). I am having difficulty in the last few days connecting to my Vera when away from the local WAN. It worked up until recently but just won’t connect anymore unless I am at home and connected to the home WAN. This has occurred on both my iPhone 5 and my iPad. How can I troubleshoot it. Hi, I’m can’t seem to figure out how the new Action Button opens another iOS app. Love the app and my wife and I use it every day! I want to put a +1 in for the feature allowing for buttons to change screens. That little home button is tricky to hit and we often inadvertently turn on/off lights while trying to push it. You;re not the first to request that feature! I have not found a nice and affordable wall mount for iPhones or iPads. I ended up making my own out of a blank face plate for a double pattress box. 15 minutes with a drill, hacksaw and Dremel. Hi guys, Great app! I love it but have a couple of issues. 1- I have CO2 and Atmospheric pressure displayed using the Multi Value display and data from my Netatmo devices. For some reason, the Multi Value display always displays “%” as the units despite the devices’ Units and UnitsDisplay parameters. 2- On the iPad when in landscape mode, the PIN popup is in the wrong orientation. It still works, but it’s definitely a bug. 1) This is a known issue with this control. It should display units for certain known quantities, and no units for everything else, but it does not take any unit information sent from Vera into account. A future version will fix this. 2) Does rotating the iPad back and forth help? I have not been able to reproduce this, can you tell me your iPad type, iOS version and whether or not you have “Sliding Home Panel” enabled in the app’s settings please? Glad to hear your working on a fix for #1. With regard to #2, rotating the iPad back and forth does not fix the issue. I have the issue on both of my 3rd generation iPads. The issue was present with iOS6 and still persists after upgrading to iOS7. I had “Sliding Home Panel” enabled, but disabling it had no affect to the issue. I’ll email you a couple of screen shots. Apple IOS7 is not working problem with VistaCam PT Foscam. When you switch to pan and tilt view, the close button in the top right hand corner is not working. I believe this may something to do with the control center which is a swipe down. It seems the close button is to close to the top. It works perfect with IOS6. Is there a fix?